Indianapolis Motor Speedway will celebrate the 50th anniversary of Mario Andretti’s lone Indianapolis 500 victory in May with a variety of activities, including a featured exhibit within the Speedway’s museum and a commemorative logo. Andretti won the 53rd Indianapolis 500 on May 30, 1969 driving the No. 2 STP Oil Treatment Hawk III-Ford fielded by colorful team-owner Andy Granatelli. The victory _ and Granatelli’s subsequent Victory Lane kiss on Mario’s cheek_ remains one of the most noteworthy achievements of Andretti’s incomparable career. Andretti also captured the 1978 Formula One World Driving Championship with Team Lotus, four IndyCar championships, a Daytona 500 victory with Ford Motor Company and victories in the Rolex 24 at Daytona and 12 Hours of Sebring. The 103rd Indianapolis 500 is scheduled for Sunday, May 26 around the 2.5-mile IMS oval. The Month of May at IMS will open with the INDYCAR Grand Prix on Saturday, May 11. _ A 50th anniversary logo has been designed to celebrate Andretti’s historic Indy victory. It features Andretti giving his famous wave next to the Borg-Warner Trophy moments after winning the 500. The logo was illustrated with the Speedway in mind, with the zero (in the 50) representing the oval of the track and the historic Yard of Bricks start/finish line. The base of the 50 is adorned with Mario’s signature, with the badge honoring the Andretti family crest. _ Andretti will be featured on IMS Bronze Badges. _ The logo also will be featured on the cover of the 2019 Indianapolis 500 Official Program, with a special artist’s rendering of his unforgettable victory. _ Memorabilia and celebratory officially licensed Mario Andretti and IMS merchandise, including apparel, headwear, replicas, jewelry, wall décor, collectibles and other special items, will be available for purchase. 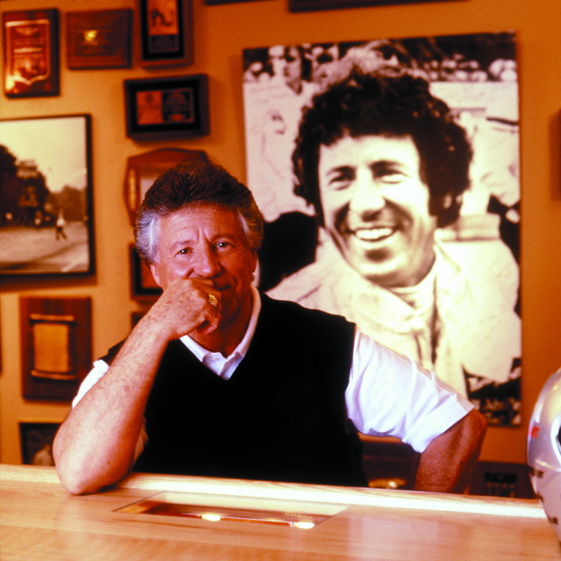 For inquiries regarding business management and representation for Mario Andretti, contact John Caponigro at 248-613-1977, jc@sportsmanagementnetwork.com. INDYCAR’s expanded presence on network television in 2019 through its new partnership with NBC Sports Group will not only include the 103rd edition of the Indianapolis 500, along with other action at Indianapolis Motor Speedway in May, but also the IndyCar Series’ new season-finale at WeatherTech Raceway Laguna Seca near Monterey, Calif. Eight of this year’s 17 IndyCar Series races will air on NBC, representing a 60 percent increase of network television exposure over a season ago. NBC Sports Network, entering its 12th consecutive year telecasting INDYCAR events, will air nine races. The television schedule for IndyCar Series qualifying sessions will be announced later. All INDYCAR on-track action will be available through NBC Sports, with nearly 350 hours accessible between linear television and digital streaming coverage. NBC Sports Gold, NBC Sports’ direct-to-consumer streaming product, will offer a package _ INDYCAR Pass _ that will feature live IndyCar Series practice and qualifying sessions, same-day race airings and Indy Lights presented by Cooper Tires events. Details on how to sign up for INDYCAR Pass on NBC Sports Gold will be announced soon. The Indianapolis 500 will air on NBC for the first time this May. “The Greatest Spectacle in Racing” _ the largest single-day sporting event in the world _ will receive special promotion with inclusion in NBC Sports’ “Championship Season” marketing campaign, a May-to-July spotlight of high-profile events airing on NBC Sports platforms such as horse racing’s Triple Crown, the NHL Stanley Cup Final, French Open tennis, and the Tour de France endurance cycling race. INDYCAR coverage on NBC begins with the INDYCAR Grand Prix on Saturday, May 11, from the Indianapolis Motor Speedway road-course. Following the Indy 500 from IMS on Sunday, May 26, NBC will carry both races on Detroit’s Belle Isle street circuit (Saturday-Sunday, June 1-2) and permanent road-course races at Road America (Sunday, June 23), Mid-Ohio Sports Car Course (Sunday, July 28), Portland International Raceway (Sunday, Sept. 1) and the finale at WeatherTech Raceway Laguna Seca (Sunday, Sept. 22). The races in Portland and Monterey represent a final push to crown the IndyCar Series champion live on network television. The 2019 IndyCar Series season kicks off on NBCSN with the street race in St. Petersburg, Fla., (Sunday, March 10). INDYCAR’s inaugural race at Circuit of The Americas in Austin, Texas, (Sunday, March 24) also will be on NBCSN. NBCSN also will telecast three IndyCar Series oval-track races on Saturday nights _ “America’s Original IndyCar Series Night Race” at Texas Motor Speedway in Fort Worth (Saturday, June 8), Iowa Speedway in Newton (Saturday, July 20) and Gateway Motorsports Park in Madison, Ill., (Saturday, Aug. 24). Sunday, March 10: Streets of St. Petersburg Fla., NBCSN, 1 p.m.
Sunday, March 24: Circuit of The Americas, Austin, Texas, NBCSN, 1 p.m.
Sunday, April 7: Barber Motorsports Park, Birmingham, Ala., NBCSN, 4 p.m.
Sunday, April 14: Streets of Long Beach, Calif., NBCSN, 4 p.m.
Saturday, May 11: Indianapolis Motor Speedway road-course, NBC, 3 p.m.
Saturday, June 8: Texas Motor Speedway, Fort Worth, NBCSN, 8 p.m.
Saturday, July 20: Iowa Speedway, Newton, NBCSN, 7 p.m.
Sunday, July 28: Mid-Ohio Sports Car Course, Lexington, Ohio, NBC, 3 p.m.
Sunday, Aug. 18: Pocono Raceway, Long Pond, Pa., NBCSN, 2 p.m.
Saturday, Aug. 24: Gateway Motorsports Park, Madison, Ill., NBCSN, 8 p.m.
Sunday, Sept. 1: Portland (Ore.) International Raceway, NBC, 3 p.m.
Sunday, Sept. 22: WeatherTech Raceway Laguna Seca, Calif., NBC, 2:30 p.m.